CRESCENT CITY CRESCENDOS: Santa Barbara, like many another community, has heard more than the usual share of music from New Orleans since the disaster-natural and societal-of Hurricane Katrina. We’ve heard Dr. John, the Preservation Hall Jazz Band, and the Dirty Dozen Brass Band locally, and the music struck our ears with a new emotionality, tinged by sympathy for the great and beleaguered city. 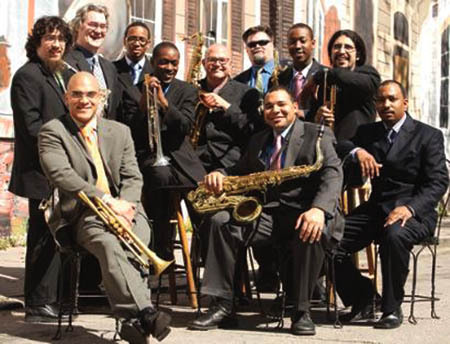 In some ways, though, the most important traveling New Orleans group, post-Katrina, is the New Orleans Jazz Orchestra-aka NOJO-which brings its program New Orleans-Then and Now to Campbell Hall on Friday. Formed in late 2002, NOJO is a saucy big band with a broadly embracing musical perspective, drawing on music from New Orleans’ illustrious history and pressing contemporary impulses. At the helm is gifted trumpeter-composer Irvin Mayfield, mentored by Wynton Marsalis and also the leader of his own quintet and the steamy Latin-jazz-gumbo group Los Hombres Calientes. Mayfield, who tragically lost his father to drowning in the hurricane, has logically adapted Marsalis’s concepts. Manhattan has Jazz at Lincoln Center, and the Crescent City has its NOJO. The band’s touring tendencies exist to spread its gospel to the Santa Barbaras of the world. FRINGE PRODUCT: Visionary drummer Paul Motian is on a creative high. Never mind that he’s 76 and has decided to retire from the road and just work in his (geographically) small town. Lucky for us, that town is New York City, where Motian’s various projects can still be heard live, including in that jazz basement-temple, the Village Vanguard. Meanwhile, Motian has reunited with his old label, ECM, and continues to put out great albums. This year’s Motian model on ECM is the newly released Time and Time Again, another disarmingly dazzling album by a trio which has quietly survived the jazz storms for over 20 years, emerging as one of the most distinctive “side” projects of the last quarter-century. It began humbly, and basslessly, in the mid ’80s, when Motian called on wily wizard guitarist Bill Frisell and tenor sax poet/muscleman Joe Lovano. At the time, the careers of all involved were gaining momentum. Frisell was an unassuming guitar hero-in-training. Lovano’s solo career would begin its liftoff a decade later. Motian, who had already played sideman to Bill Evans and Keith Jarrett by then, was belatedly discovering he had something generous to offer as a leader/composer. If any single jazz musician deserves a MacArthur “genius” grant and any other official accolade at this point, Motian is the one. He has been busy building a discography and an aesthetic while too few were looking and listening. Frisell plays with extra sensitivity and sonic painterliness, while Lovano sounds better than ever, having lived with and helped define the Motian sound for decades. They live their various separate musical lives, but convene and settle easily into a three-way conversational mode that is theirs alone. Admittedly having just been lulled into submission by another spin of this masterful disc, I believe the Motian trio seems like one of the finest and most instantly identifiable trios in jazz history. It may have begun its life as a lark, but that lark has sturdy wings by now. Like many an important project in the arts, it’s an accidental miracle. (Got e? fringebeat@independent.com).